New Air Conditioning in entire condo! This spacious top floor, one-bedroom condominium in Kuhio Shores offers an open living, dining and kitchen area, well appointed bedroom and bathroom and impressive lanai (covered deck for you non-islanders). Enjoy gorgeous views of the ocean, mountains and sunrise from the living area and lanai and fabulous sunset views from the bedroom. Amenities include: free parking, WiFi, coin operated washer/dryer, cable, elevators, outdoor BBQ grills, outdoor showers, sheets, towels, coffee maker, microwave, equipped kitchen and more. Hoai Bay is in front of the building and is perfect for watching local surfers or sea turtles. In addition to that, you are close to some of the best snorkeling that Kauai has to offer. 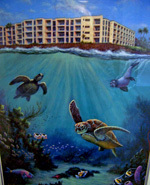 The condo is walking distance to Kukuiula Shopping Center where there are restaurants, bars, boutiques and galleries. Enjoy all the outdoor activities the island has to offer or relax and take in the view. The choice is yours! Don't miss out on the Beach House Restaurant located next door for a cocktail, dinner and especially the sunset. If you are looking to celebrate a wedding, honeymoon, anniversary, birthday, or life in general, Kuhio Shores #403 is the place for you.